Figure A. Alexa488® conjugated rat anti mouse CD68 (MCA1957A488) and Alexa647® conjugated Rat IgG2b isotype control. Figure B. Alexa488® conjugated rat anti mouse CD68 (MCA1957A488) and Alexa647® conjugated rat anti mouse CD107b (MCA2293A647). All experiments performed on murine peritonial macrophages in the presence of murine SeroBlock (BUF041A). Rat anti Mouse CD107b antibody, clone M3/84 (MCA2293) used for the identification of MAC-3 expressing cells in mouse spinal cord sections by immunofluorescence. ISG15 and PKR protein expression of astrocytes, oligodendrocytes, and microglia/macrophages in spinal cord white matter lesions at 98 dpi. ISG15 (green) is expressed by astrocytes (red, a), oligodendrocytes (red, c), and microglia/macrophages (red, e) demonstrated by an orange-yellow mixed color (arrows). No co-localization of PKR (green, arrowheads) with GFAP (red, arrows) indicates no/low PKR expression in astrocytes (red, b), whereas co-localization of PKR (green) with Olig2 (red, d) and MAC-3 (red, f) demonstrates PKR expression in oligodendrocytes and microglia (arrows). Immunofluorescence double-staining for ISG15 and PKR with GFAP, Olig2, and MAC-3. Nuclei are stained with bisbenzimide. Bar 25μm. 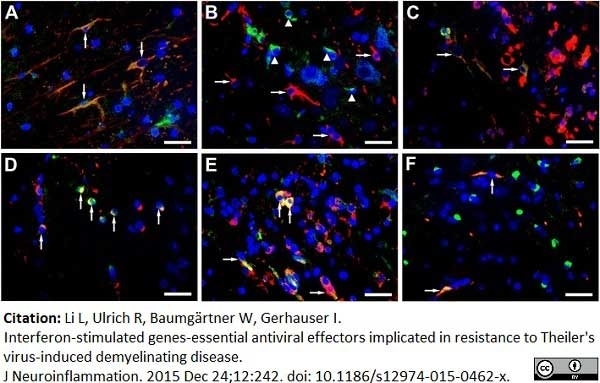 From: Li L, Ulrich R, Baumgärtner W, Gerhauser I.
Interferon-stimulated genes-essential antiviral effectors implicated in resistance to Theiler's virus-induced demyelinating disease. J Neuroinflammation. 2015 Dec 24;12:242. 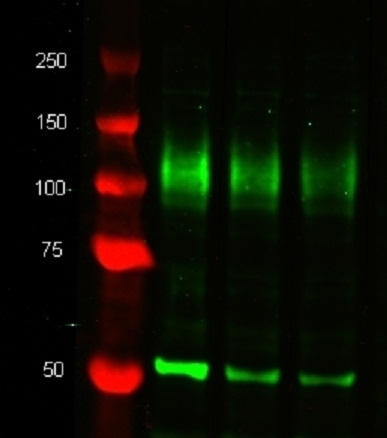 Rat anti Mouse CD107b antibody, clone M3/84 recognizes murine CD107b, also known as MAC-3 and LAMP-2. CD107b is a transmembrane glycoprotein that is associated with lysosomal membranes and is primarily expressed on mononuclear phagocytes. Expression of CD107b does vary between cell populations and the molecular weight of CD107b can vary between ~92-120 kDa. Studies suggest that CD107b may be involved in leucocyte adhesion. The expression of CD107b is predominantly cytoplasmic - flow cytometry results are improved by the use of a membrane permeabilisation procedure prior to staining. Glycoproteins purified from mouse peritoneal macrophage membranes. Spleen cells from immunised Lewis rats were fused with cells of the mouse P3-NSI/1-Ag4-1 myeloma cell line. Springer, T.A. (1981) Monoclonal antibody analysis of complex biological systems. Combination of cell hybridization and immunoadsorbents in a novel cascade procedure and its application to the macrophage cell surface. J Biol Chem. 256 (8): 3833-9. Flotte, T.J. et al. (1983) Dendritic cell and macrophage staining by monoclonal antibodies in tissue sections and epidermal sheets. Am J Pathol. 111 (1): 112-24. Ho, M.K. & Springer, T.A. (1983) Tissue distribution, structural characterization, and biosynthesis of Mac-3, a macrophage surface glycoprotein exhibiting molecular weight heterogeneity. J Biol Chem. 258 (1): 636-42. Ulrich, R. et al. (2010) Machine learning approach identifies new pathways associated with demyelination in a viral model of multiple sclerosis. J Cell Mol Med. 14 (1-2): 434-48. Amirbekian, V. et al. (2007) Detecting and assessing macrophages in vivo to evaluate atherosclerosis noninvasively using molecular MRI. Proc Natl Acad Sci U S A. 104: 961-6. Fan, D. et al. (2014) Differential role of TIMP2 and TIMP3 in cardiac hypertrophy, fibrosis, and diastolic dysfunction. Cardiovasc Res. 103 (2): 268-80. Higuchi, Y. et al. (2012) Upregulation of anticoagulant proteins, protein S and tissue factor pathway inhibitor, in the mouse myocardium with cardio-specific TNF-α overexpression. Am J Physiol Heart Circ Physiol. 302: H2352-62. Ishibashi, M. et al. (2004) Critical role of monocyte chemoattractant protein-1 receptor CCR2 on monocytes in hypertension-induced vascular inflammation and remodeling. Sato, A. et al. (2008) Thioredoxin-1 ameliorates cigarette smoke-induced lung inflammation and emphysema in mice. J Pharmacol Exp Ther. 325: 380-8. Xu, J. et al. (2007) Role of cardiac overexpression of ANG II in the regulation of cardiac function and remodeling postmyocardial infarction. Am J Physiol Heart Circ Physiol. 293: H1900-7. Zhao, Q. et al. (2004) Essential role of vascular endothelial growth factor in angiotensin II-induced vascular inflammation and remodeling. Hansmann, F. et al. (2012) Highly malignant behavior of a murine oligodendrocyte precursor cell line following transplantation into the demyelinated and nondemyelinated central nervous system. Cell Transplant. 21 (6): 1161-75. Herder, V. et al. (2015) Dynamic Changes of Microglia/Macrophage M1 and M2 Polarization in Theiler's Murine Encephalomyelitis. Brain Pathol. 25 (6): 712-23. Bröer S et al. (2016) Brain inflammation, neurodegeneration and seizure development following picornavirus infection markedly differ among virus and mouse strains and substrains. Bobbala, D. et al. (2016) Interleukin-21-dependent modulation of T cell antigen receptor reactivity towards low affinity peptide ligands in autoreactive CD8(+) T lymphocytes. Raddatz, B.B. et al. (2016) Central Nervous System Demyelination and Remyelination is Independent from Systemic Cholesterol Level in Theiler's Murine Encephalomyelitis. Brain Pathol. 26 (1): 102-19. Ciurkiewicz, M. et al. (2018) Cytotoxic CD8+ T cell ablation enhances the capacity of regulatory T cells to delay viral elimination in Theiler's murine encephalomyelitis. Brain Pathol. 28 (3): 349-368. Fayyad, A. et al. (2018) Matrix metalloproteinases expression in spontaneous canine histiocytic sarcomas and its xenograft model. Vet Immunol Immunopathol. 198: 54-64. Li, L. et al. (2015) Interferon-stimulated genes-essential antiviral effectors implicated in resistance to Theiler's virus-induced demyelinating disease.